If I join the PTA do I need to volunteer my time? No. Your PTA membership and participation in fundraisers provides FUNDS for PROGRAMS (materials) at OPE. The PTA raises money though 2 fundraisers: memberships and Jog-A-Thon to provide Programs (materials) at OPE which enrich our students education, health and well being. The PTA also raises funds to benefit the Media Center through The Fall Book Fair. The PTA volunteers provide support to teachers, parents and the school by leading many of the programs. The PTA holds a monthly meeting listed on the calendar open to the school parent population. How is the PTA different from EEF? Why should I donate to both? PTA provides PROGRAMS (materials) to OPE and raises money to fund the PROGRAMS (materilas). Enrichment Teachers are funded by EEF at OPE but their PROGRAMS (curriculum and supplies) are fully funded by the PTA. The PTA also provides ACADEMIC CLASSROOM SUPPORT to teachers by funding supplies, curriculum enhancements and special programs in classrooms. EEF raises money to fund PEOPLE (Enrichment Teachers) not funded by the school district. These POSITIONS are determined by the School Site Council to meet the needs of the OPE student population. Both the PTA and EEF are needed to making our school great! The PTA membership drive and EEF Invest in Your Child pledge drive are both at start of the school year. The PTA jog-a-thon is in January / February. EEF Fundraising events (gala, online auction, Pancake Breakfast and Poker Night) occur in the spring. The School Site Council develops a plan and budget to allocate the supplemental funds EEF raises through parent contributions to fund POSITIONS. The board is comprised of administrators, teachers and parents. Their focus is to provide our children with the best education possible. The School Site Council holds a monthly meeting listed on the calendar open to the school parent population. What are the fundraisers for PTA and EEF at OPE? Our family is new to OPE how to we get involved in the community? How can I volunteer for a PTA event? Contact Erika Lozuk (erika.lozuk@gmail.com / admin@ptaatope.org) or Signup on the Signup Genius that will be posted before many events. How can I join the PTA board or lead a program? What time is morning recess? Is there a music program at OPE? Yes! We're are very fortunate to have a full-time Music Enrichment Teacher funded by EEF at OPE with the music PROGRAM (materials) funded by the PTA. A very special morning honoring Grandparents (or a special non-parent in your child's life) with two all-grade concerts, reception and classroom visit time. Watch the 2016 Grandparents Day concert Grandparents Day is always the Friday before Memorial Day. The students and parent volunteers dress up for the annual theme. 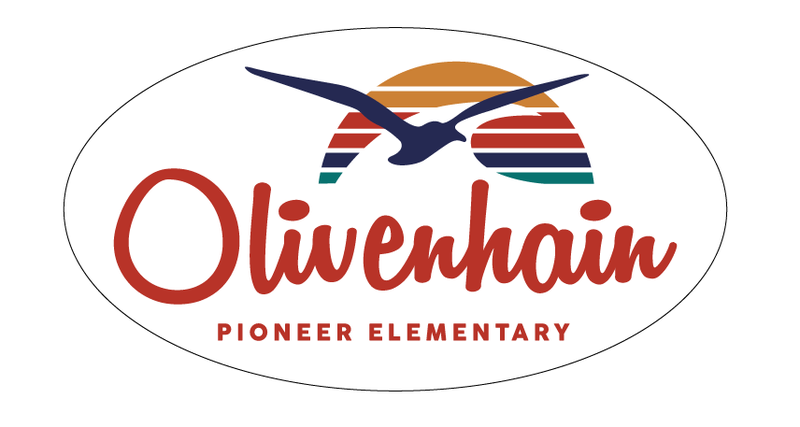 What is the Olivenhain Pioneer School Song? O P E Eagles! We Soar! What is a Spirit Day? Days where the students are encouraged to show their OPE Spirit and wear their OPE logo t shirt or sweatshirt. Frequently on these days, there will also be an all school assembly at the lunch area in the morning. The PTA's Spirit Wear sale is at the beginning of the school year. What is Gold Rush Day? On Gold Rush Day in March, the 4th grade takes over the ball field and runs a simulated 1850s mining camp town after weeks of preparation. Parents are also very involved in the event day and dress up too! This event is a grade level program and is not funded by the PTA. What is the Room Parent Fund? Room parents request money per student at the beginning of the year to be used for Staff Appreciation Week, grade level treats for the staff (each grade provides treats once per school year), and class parties. These funds are separate from the PTA Programs. What is the annual school musical? The annual school musical is put on by the 6th grade classes of Mr. Dickinson and Mrs. MacGregor in June. Always an amazing production not to be missed! DIY room where students can gather to create, invent and learn. What are New Student Play Dates? Over the summer a number of play dates are planned for incoming kindergartners, students and families that are new to OPE. This is a great opportunity to become acquainted with other students and families at our school. All play dates are at SUN VISTA PARK playground on Avenida La Posta at Rancho Santa Fe Road (across RSF Road from OPE). Please note there are no public restrooms at the park. Check the PTA website calendar or contact the PTA New Parent Liaison for the current summer dates.